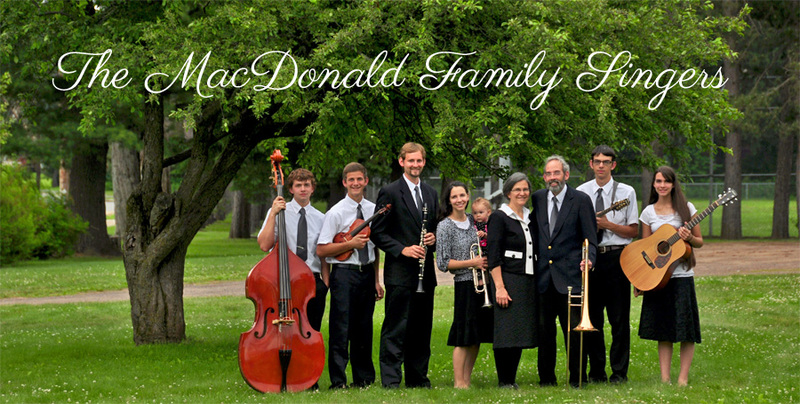 The MacDonald Family Singers is a homeschooling family—made up of nine members, the children range in age from fourteen to twenty-nine and started with just a vocal program. As the children grew, instruments and more musical styles were added. They bring 10-15 instruments to their concerts, including a keyboard, brass, and various stringed instruments. Their repertoire includes original Scripture melodies, a cappella hymns, traditional, gospel bluegrass, and sacred classical. They sing at churches, nursing and retirement homes, community events, camps, senior centers, and other various venues. With the purchase of a bus in 2003, the MacDonald family has had the opportunity to make several cross-country singing tours per year. Their albums Honey In The Rock, Power In The Blood, and Glorify The Lord With Me are available to listen or download here. The MacDonalds count it a privilege to share the Gospel message of Jesus Christ where ever they go. Dr. William and Madeline MacDonald, Victor's parents, introduced Laurie to Victor in 1981 during the last year of her studies with Dr. Paul Rutman at The Hartt School of Music. Victor had already finished his Biblical Studies at Gordon College a year before. Both being very active in their church and school music departments while growing up, it became a joy to serve the Lord together with their family. Joanna Joy Hollis was born August 10th, 2012. She likes to eat, sleep, and grab almost everything that is in sight. A roadie extraordinaire and bass player! He loves to work hard. He’s a valuable piece of our group keeping the beat steady and blending his voice to make our unique mix. Nathan is our grease monkey; he’s not afraid to get his hands a little dirty. Daniel our blue eyed blond adds his unique voice in solos and group songs. When home or on the road he’s very helpful and always a good choice for a work partner. He makes exceptional manicotti and loves trying out recipes.